A content writer by profession, my productivity was defined as the number of stories I wrote in a week and the quality of those write-ups. I felt I was doing a decent job, meeting my target of three stories a week. Amidst my ‘content’ routine, I found myself in the Sahaj Samadhi Meditation Program. Perhaps my meditation mantra would help me sustain my creative abilities with words. However, I least expected what I got. Within a few days, some hidden potential seemed to have been uncovered. My stories moved from acceptable to excellent, receiving numerous accolades from colleagues and managers alike. And then last week, for the first time, I came up with three publish-quality articles in just two days’ time! Now that’s what I call productivity – all thanks to a few minutes of meditation. Maybe meditation is the key to having your personal story-telling angel watch over you. The interesting part is, meditation seems to have been the secret to a lot of “I-can-make-you-perform- better-than-ever-before’ angels for a lot of people. 1. Work that would take me many hours is now done in express time! Meditation had an immediate impact on my work. Work that would normally take me many more hours was completed in much less time and neither was I feeling as tired or stressed. If I meditate before a big meeting, a discussion with an important client, or a workshop, I find I contribute and connect better, leading to numerous successes at work. 2. Exam fear is out! One revision and I’m all set! Within six months of starting meditation, my number of revisions went down from three to one. After one year, no revisions were needed at all! I feel so confident now to appear for exams. 3. You have no idea what secrets meditation can unfold! I have always been a very good performer. Every two years I would get promoted and a bigger responsibility would come. Despite all this, it was effortless for me. When you really integrate meditation and pranayama in your life, life becomes effortless. All the running around, the challenge of completing targets and all the erratic work hours is going to be easy. 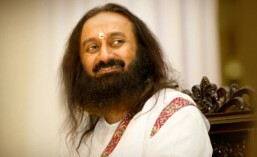 ← My Gurudev takes care of everything!